Indoor air quality is determined by the supply rate of different pollutants, their chemical interaction, the dilution of these substances through ventilation - and their resulting effects on IAQ (the human health or the perceived air quality). These effects are, to a very large extent, unclear or unknown and the IAQ is generally defined through specific air flow rates or through IAQ indicators (see section 2.4.2). So most tools for the evaluation of IAQ are based on ventilation rates. These flow rates may be converted to IAQ indicators such as CO2 levels by combining an assumed supply rate of e.g. CO2 and the dilution due to the ventilation. General calculation methods for natural ventilation are detailed, requiring information on the location and area of window openings, local wind speed, local wind direction, building geometry and interior building design. Surrounding buildings and the local landscape influence the local wind speed and direction. 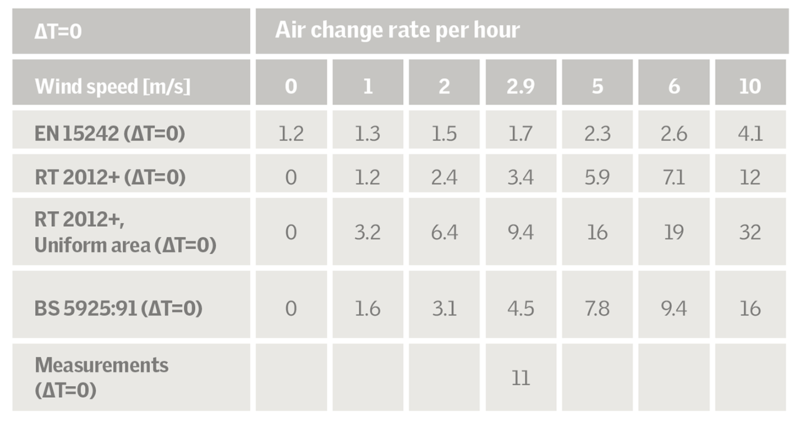 Based on this information, the pressure differences across each window opening are calculated, and the resulting airflow across each opening and through the entire building are determined. Simple cases of the general calculation methods are available for specific building design cases, such as window openings placed on only two opposite sides of a building. The general methods are described in several guidelines (AIVC, 1996; SBi 202; CIBSE AM 10, 2005) and are also implemented in a number of detailed building simulation tools, such as IDA-ICE, VELUX Energy and Indoor Climate Visualizer (EIC Visualizer), TRNSYS, EnergyPlus, IES VE, etc. The VELUX EIC Visualizer contains state-of-the-art methods for evaluation and illustration of ventilation flow through windows – and can be used by non-experts. Traditionally, simplified methods for calculating natural ventilation have been very conservative, only taking limited account of the full potential of natural ventilation. Typically, a worst-case approach is used that assumes only single-sided ventilation, which will lead to severe underestimation of the ventilation flow rate. However, the French institute CSTB has developed a simplified calculation method for evaluating natural ventilative cooling. The method will be implemented in the French Building Code for summer comfort in 2014. As illustrated in the table below, huge differences arise depending on which type of calculation method is applied. ​Figure 2.7.1 Measured and calculated ACH for specific situations in MAL. EIC Visualizer is based on the IDA ICE simulation engine. This engine couples airflow and thermal simulations, which is relevant for evaluations with focus on the effects of window openings, natural ventilation and solar shading. The IDA ICE engine has been validated against major European validation protocols. Ventilation systems in EIC Visualizer can be natural, mechanical or a mix of the two (hybrid). Heat recovery can be used with mechanical and hybrid ventilation. The tool performs a calculation of natural airflows that considers infiltration through the constructions and controlled natural ventilation through windows. The airflow of the mechanical system is included in the total ventilation rate of the building. The mechanical system can be exhaust only, or balanced, with or without heat recovery. The ventilation can be controlled based on one of two overall strategies, i.e. either “manual” control or demand control. The system can automatically switch between the two modes based on outdoor temperature, to ensure that the most energy-efficient mode of ventilation is used. The “manual” controls for natural ventilation are designed to mimic typical use of windows as providers of natural ventilation. Demand-controlled ventilation is based on CO2 as indicator of air quality. The categories and associated CO2 levels as defined in EN 15251 are used (cat. I: 750 ppm, cat. II: 900 ppm, cat. III: 1 200 ppm). The use of sun screening is controlled based on the indoor temperature with the purpose of reducing overheating. The VELUX Energy balance and VELUX ACTIVE control systems can be used directly in the tool. See eic.velux.com for more information (Foldbjerg, Asmussen, Roy et al., 2012). Foldbjerg, P., Asmussen, T. F., Roy, N., Sahlin, P., Ålenius, L., Jensen, H. W., Jensen, C. (2012) Daylight Visualizer and Energy and Indoor Climate Visualizer, a Suite of Simulation Tools for Residential Buildings. In Proceedings of BSO 2012.